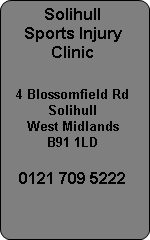 This elbow pain is difficult to resolve without treatment so a trip to our Solihull physiotherapists for a course of elbow physiotherapy will help you resolve the problem. The longer you ignore the condition, the worse it gets and the longer it takes to fix. Tennis elbow is an inflammatory condition generally caused initially by overuse. Tennis elbow often affects the non dominant side which patients find hard to understand why the non dominant arm is affected by overuse. It normally results from doing heavy lifting or repetitive movements with both arms such as moving furniture. As the weaker arm is now having to do the same work as the stronger arm when performing 2 handed activities it gets injured because it is not conditioned like the stronger side. Physiotherapy treatment will involve "stripping out" the extensor muscles in the forearm with soft tissue techniques and ultrasound and interferential electrotherapy treatment. Ice and the use of an epicondyle strap will relieve the stress and reduce inflammation before a strength and conditioning phase begins.